Sports Investment Banking: The Best Way to Advise Manchester United *and* the Golden State Warriors? One of the benefits of working in a media & telecom group in banking is that you also get to work with sports teams and leagues: after all, what media baron would pass on the chance to own a few of their own sports franchises? But sometimes, you need to skip all the media and telecom business and go directly to the source to advise sports teams directly. This is where finance and sports meet and what the sports coverage group is all about. Just like how Aerospace & Defense is a cross between industrials and technology, sports coverage is a cross between media coverage and real estate (hospitality) coverage. You’ve got media rights for sale to broadcast individual events or a series of events, and then stadiums (properties) that influence a team’s valuation. This interview was inspired by the work of Robert Fuentes, Michael Dinerstein, and Daniel Fernandez from Stanford University, who taught a seminar on the business of baseball alongside the book Moneyball. Q: What does it take to do well as a sports-oriented investment banker? “First you have to have your technicals down. You’ve got your attention to detail, knowledge of valuation approaches, and ability to transfer these two items into some solid financial and valuation models. As a senior banker, it’s your task to create and cultivate relationships… so you spend a lot of time speaking with sports teams, leagues, and the banks that compete to finance them, but you knew that already. Q: That seems pretty standard – what makes your story different, and why do most people get into sports IB? A: Most people who go into sports investment banking do so after spending some time at another department. It’s a combination of love for the game and a commitment to the career. Sports investment banking isn’t about valuing physical assets or valuing technology patents – it’s about seeing the potential of a team to win. Winning generates an interest in a particular team, and that interest translates into ticket sales, concession (food) sales, and of course purchases of official team gear. If a team isn’t performing, your task goes from standard assignment to distressed or even restructuring. But that isn’t always the case, and as you know, valuation is more art than science; a loyal fan base and a strong market for a team can make up for a not-so-hot win record. Q: Right, that’s an interesting way to look at it: you get exposure to both traditional IB work and also some “turnaround” strategies. So what encompasses the professional sports sector? A: Baseball, basketball, and football teams and leagues fall under my domain. There are other sports too, but those are the major ones we cover. It wasn’t always that way: there once was a time when boxing and horseracing were top sports. Here’s a good list of “sports comps” that goes beyond the typical franchises you might think of, such as Manchester United and Madison Square Garden; the list includes companies like Disney because it owns an 80% stake in ESPN. Within those sports, the basic division consists of teams and leagues. Stadium financing falls under public finance because you have municipalities and states shelling out cash in order to sponsor construction. My coverage team might be brought in to bring a more focused (and correct… arguably) perspective, but that’s more the exception rather than the rule. You see an interesting relationship between a coverage group and a product group – sometimes the product group will get staffed on developing a sector update, while the coverage group assembles the more technical valuation work (ex: transaction comps and merger consequences analysis) and other times, the teams will work the other way around. You might also see sports coverage as part of the private banking department (example for Citi here). The rationale is in-line with the whole “wealth preservation” approach to investment. Q: What are some typical assignments in your group? A: I can only speak about my bank, but most of the time you are writing up ideas on potential acquisition ideas (company profiles) and updating more product-oriented pages on who is buying, for what price and multiples, and for what reasons. Every now and then, we showcase macroeconomic data as part of the sector update and to provide some color on our commentary about the space. When it comes to capital raises, we look toward the equity comps I mentioned before, because those provide a decent barometer of whom we are looking at when it comes to raising money. Pardon the pun, but it really is a whole different ballgame, so I don’t want to look at capital equipment or healthcare companies’ activities because their balance sheets are built up differently (you don’t see Manchester United offering financing options or credit cards to buy jerseys). Q: So what moves the market for sports companies? A: Internally, you’re looking at the strength of the brand and audience reception. You’re also looking at the company’s ability to retain star players. Audience reception is key because popularity will drive ticket sales, and in turn, ticket sales will drive merchandise sales and corporate sponsorships. Corporate sponsorships consist of arena signs, on-air commentary, print/online materials, and sometimes direct logos on an athlete’s uniform (as seen in NASCAR and in some soccer teams). You may also see pay-per-view programs brought to viewers by a particular sponsor, analogous to how individual stadiums have their names changed depending on the corporate backer. You can also generate revenue via the sale of broadcasting rights and licensing. Broadcasting rights are pretty simple: you offer exclusivity to a particular television or cable channel. You’ll want one that is in-line with your overall product – you wouldn’t see a program catering toward young men on a channel devoted to women, for example. A: On licensing, imagine partnerships with particular vendors to deliver content using the themes and concepts of the sport. Similar to the selection of your investment bank, these media companies will want to choose the “best horse” when it comes to distribution. A particular athlete may star in a movie, so the fans will be interested. To get these fans to buy a ticket, you need good marketing and even stronger distribution capabilities. So investment or spending on a sports team really comes down to how you want to reach your audience: do you want to get exposure to a particular crowd or demographic? A sports team would be one way to go about that. For something such as the WWE (World Wrestling Entertainment), live and broadcast event ticket sales and viewership contribute a significant portion to revenue. Much like a sports event, the spectacle itself attracts a particular audience, who holds a variety of substitutes competing for equal and divided attention. The interest in individual athletes, characters, models, or even staff members constitutes the backbone of content when it comes to developing print or even video game media. The story arc among characters develops through televised programming, and you might say a chapter ends with a pay-per-view type event. 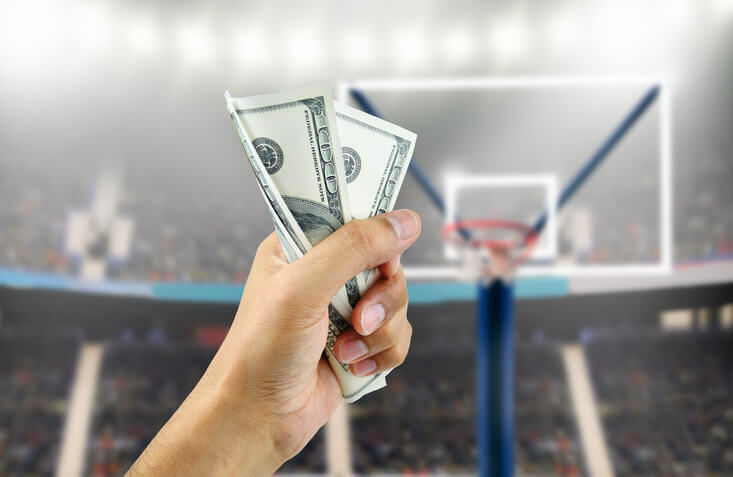 These cable providers can afford to shell out higher payments to sports companies, and they represent a good source of revenue compared to regular or local network providers. Q: Great, thanks for explaining that. What about external factors that influence sports teams and leagues? A: Externally, you’re looking at personal disposable income, other companies’ marketing (to sponsor games, uniforms, etc) and hospitality budgets (to buy premium courtside/ringside seats or even rent boxes and rooms at an arena). Above all else, the popularity of the sport is paramount. The main risk to any sports team is to stay relevant for the next generation – “competitors” to any sport include other sports leagues, including at the professional and college levels, and of course, online piracy (though ratings for sports events have stayed high compared to other TV broadcasts because so much of the appeal lies in watching them live). This last element is discussed and highlighted ad nauseum among movie previews and it’s even addressed through strategic partnerships with distributors such as Blockbuster (well, not so much anymore), Netflix, Hulu, and even YouTube. Now, you can watch a game two days after the fact and still be interested (highlights, anyone?). You have a diehard and loyal fan base supporting the storage of these videos. Much smaller sources of revenue might include catering services or even the sale of parts and vehicles (source: Speedway Motorsports, the operator of NASCAR events). Q: OK, so let’s say that I want to buy a sports team – or an entire league, for that matter. Whom do I have to compete with? Other sports leagues? Media conglomerates? Mark Cuban? A: Leagues are akin to a fraternity, so deal-making is more like the purchase of a seat at the table and less like the purchase of a car. The purchase of teams or leagues is subject to much more regulation than you might expect. When you produce an interloper analysis, or potential buyers page, you’ll have investment companies (read: financial sponsors), central banks, and media / telecom companies all listed as potential buyers. Every now and then, you’ll see a “personality” come along and acquire a team outright, to address your point about Mark Cuban. Just as you as a banker are looking at a company, the league is taking a deep look at the acquirer as well. Due diligence goes both ways in this case, perhaps more so than due diligence in other industries. Q: Interesting… so then what are the key deal drivers or considerations when you’re buying and selling leagues and teams? Normally, you would have a target IRR – but acquiring a sports team is a different process. Financial sponsors tend to hold onto sports teams for longer periods, and they aim for a much higher return on investment as a result. 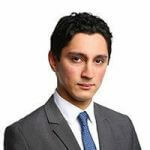 Charles Baker of the law firm DLA Piper cited uncertainty as a key M&A catalyst. So, for example, if the team has a high Debt / EBITDA ratio or its collective bargaining agreement is up in the air, both factors can influence the start of a sale or purchase process. Another difference between sports M&A and traditional LBOs, MBOs, or even Equity Buyouts (EBOs) is that debt can introduce far more limitations into deals. Q: Would you mind sharing some pitch books you’ve seen in this space? A: Sure – my favorite is this one on the acquisition of the Nashville Predators, which discusses the valuation aspect quite nicely. You still see the same valuation approaches, but the operating model needs to be tweaked to consider both team and arena revenue generation, which are influenced by the average attendance per game. You can also see how they have different operating cases there based on average attendance per game, which is something you would only see when working with sports teams. For a much larger team, you’re looking at commercial sponsorship, broadcasting, and match day (money generated from home games via ticket and concession sales) revenue generation (source: Manchester United). Consumer goods licensing is also in play here, as you have sporting goods companies competing to be the apparel of choice for the team. Sporting goods companies have an odd challenge here because if they don’t win the contract, they won’t have something awesome to sell at the stores, which translates into lost revenue for them. As I mentioned earlier, there are media partnerships, including those with mobile providers, in order to add to the revenue base. Imagine paying for content online to watch matches. In terms of valuation multiples, I focus mostly on Price / Revenue even though that might provide a pretty wide valuation range. The issue is that many sports teams and leagues have negative earnings and/or cash flow, so applying traditional multiples like EV / EBITDA, P / E, and so on doesn’t necessarily work well. You may still see them calculated if the team is in better financial shape, but for comparability purposes sometimes Price / Revenue works better. 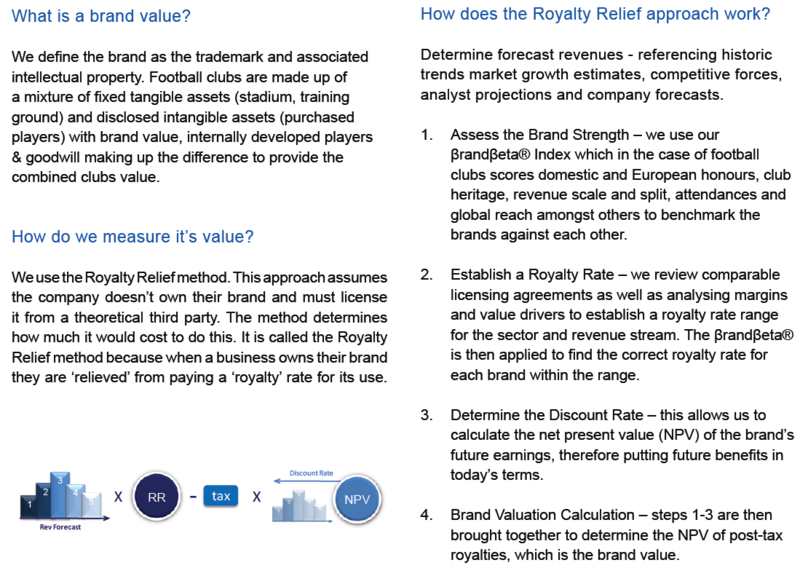 For a discussion on brand valuation, see page 16 of BrandFinance’s European Football Brands Rankings. You might wonder if the stadium of a team has anything to do with valuation. As Phillip Miller from Minnesota State University found out, it does. There’s a slight boost to valuation once a team receives a new stadium. Even modest improvements such as a new scoreboard, more seats, or the inclusion of a night club will add to the topline, and therefore boost cash flow. It’s not so much “if you build it, they will come,” but rather if you build it, people will be interested and might even show up, share the news, and spread the word to their friends. Q: Which banks play beautifully when it comes to covering the sports sector? A: I distinguish sports coverage from sporting goods coverage because the latter is covered under consumer retail. There isn’t a huge volume of deal-making in either advisory or capital raises – so when you think about how investment banking is such a tight-knit community, the community for sports M&A is even more tightly knit. Among boutiques, Inner Circle Sports, Galatioto Sports Partners, Game Plan, WB Grimes, and Park Lane are the names that come to mind. Note that most sports franchises are worth anywhere from a few hundred million USD to around $1 billion, so bulge bracket banks rarely put their “A Team” on these deals – one of the articles linked to above actually references this. As a result, a lot of smaller banks are very active in the market. Q: So what should our readers take a look at if they want to get into sports investment banking – besides the sports pages? A: While the International Journal of Sports Finance covers the more academic nature of sports, Bloomberg hosts a more practical summit on the topic. The folks there have actually posted the videos as well (under the agenda section)! If I had to choose a favorite website, I would pick SportsBusiness.com. Besides the usual suspects, you can take a look at this primer by Fitch Ratings on sports transactions. And here’s a report by WR Hambrecht that discusses franchise valuation and macroeconomics more broadly. Q: Where do sports investment bankers go once they’ve achieved Hall of Fame status? A: Most go to graduate school or move into the buy-side. They’re akin to the exit opportunities in the broader coverage of media and telecom, but you wouldn’t be as well-equipped to work with radio stations or commercial satellites. 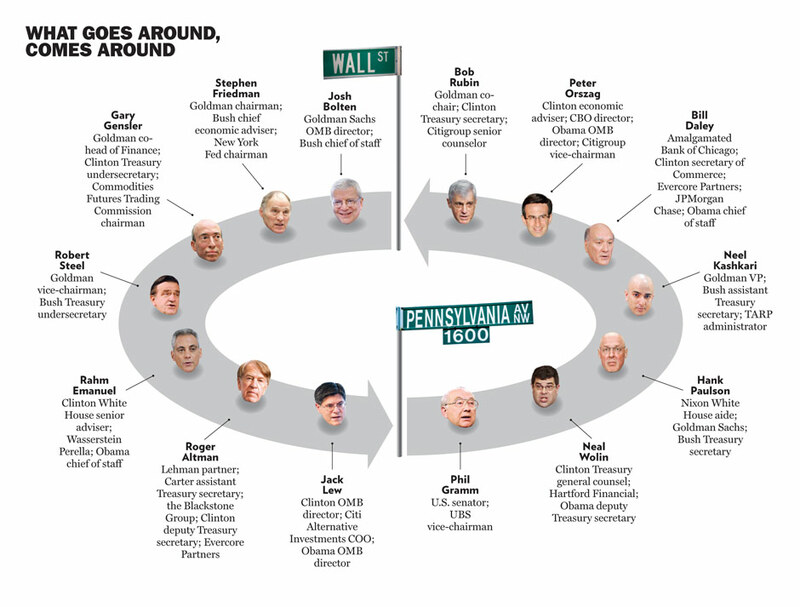 You also see these bankers moving into corporate finance roles at media outlets like ESPN and even at sports teams. Just as there is a sort of revolving door between Pennsylvania Avenue and Wall Street, there is also a revolving door between the sports sector proper and sports “finance” (investment banking and private equity). Q: Any parting words before we end this interview? The link to the Nashville Predators pitch is faulty, tried several times and received an error message as if access is no longer available. Any chance this pitch can be accessed any other way? We don’t save the links, so if it’s not there anymore you’ll have to try a Google search for it. Along the lines of Phil’s question above, I too am wondering what sort of exit opportunities exist to go from banking to sports. I am a recent graduate and would really like to try combining finance with sports somehow as a career. Great question. Check this out! http://www.prkln.com/resources/sports-industry/ This maybe what you’re looking for! I am currently thinking about my first transition to follow a bulge bracket IB analyst program. I’ve been reading your site for several years and wanted to get your opinion on best ways to target sports related exit opps. I have my own ideas but wanted to correspond with you about potential strategy. Please feel free to email. Sorry for the unrelated questiom, but I’ve heard that non-BBs (and I’m speaking of S&T) can offer better comp in the current economic state given that they are less regulated and less scrutinized. Can you speak to this? And if it’s true, might we be seeing a mass exodus to boutiques/MMs in coming years? Thanks. There is some truth to that, but I think it’s probably more true for S&T vs. hedge funds / prop trading firms than it is for traditional IBD at bulge bracket banks vs. what you see at boutiques. But yes, it is true that smaller firms are more lightly regulated. I wouldn’t say a “mass exodus” necessarily, but more people will be switching over. I’d like to know whether what role PPP (or P3 for you Americans) and project finance play in the US sports arena sector. I know that in Brazil those two are quite hot topics for the upcoming World Cup and Olympic Games. Good question – I’m not sure offhand, but I think in the US Project Finance and sports M&A / advisory are somewhat separate. Most sports M&A groups advise on buying/selling teams, stadiums, and franchises, but not necessarily the construction of arenas and stadiums in the first place. Sick interview, I’ve always wanted to know about sports business. Thanks! I really enjoyed (editing, anyway) this one as well.